Perfect for mildly corrosive liquids. Lowest cost! 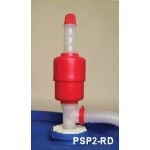 High-density polyethylene pumps are ideal for water-based liquids, detergents, even some petroleum products. Simple, foolproof operation. 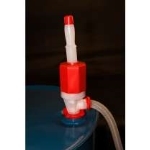 Pump bellows to start flow, control siphon action with air vent in handle. 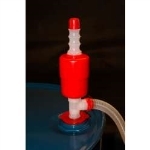 Drum Pumps are 34" long, suction tube is easily trimmed to fit all size drums. Supplied with threaded bung adapter and 48" x 7/8" hose. 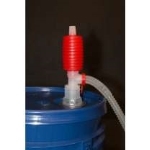 Pail Pump is 21" long, fits all pail openings. Supplied with 16" x 3/8" hose.